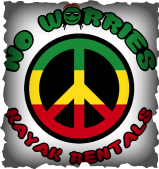 No Worries Kayak Rentals started in the summer of 2014 as a small family business running out of a pop-up tent. Our dedication to customer service and unique No Worries experience caught on fast, and we quickly outgrew our starting operations. A change in location was in order, and we found the perfect place to nestle our office: one that allows our patrons to float directly back to our office and their vehicles, avoiding the dreaded post-float shuttle! We are constantly looking to make improvements here at No Worries, and we know our story isn't complete. Come float with us and become part of the No Worries story! If you're wondering what your float down Terrapin Creek will look like, No Worries there either! Check out this video from one of our loyal No Worries floaters, the owner of Cherokee Aerials.